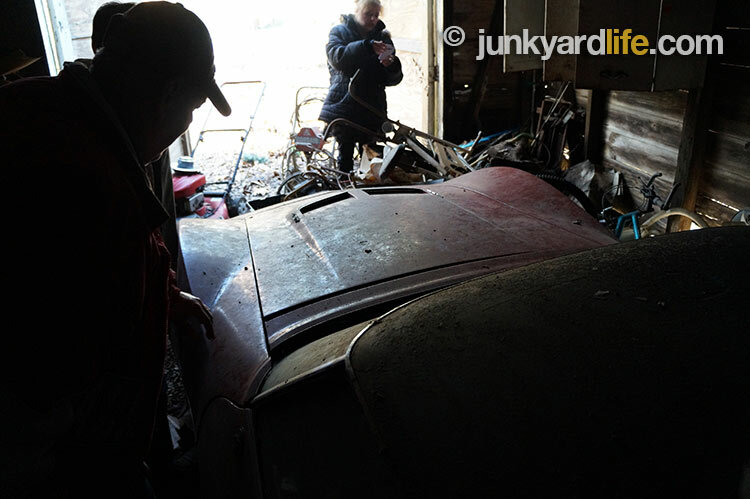 Uncovering a legend. Urban legends have a way of surviving the years. In car guy circles, urban legends can take a somewhat true story and stretch it, until it becomes simply unbelievable. We love those stories and chase them, often into futile labyrinths. Jody and I called each other names, and made fun of the other one, for even thinking this legend could be true. “You are not going to believe this,” I said. I really didn’t believe it myself. A 1968 Corvette convertible 427, with a four-speed, hidden in a north Alabama garage since the late 1970s after a police chase? What kind of folklore is that? 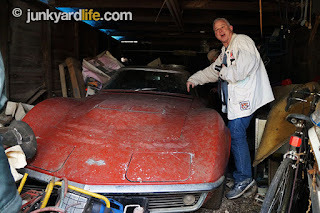 Ron Kidd points out that this big block 1968 Corvette was part of local hot rod folklore and has been hidden for the better part of the last 42 years. But, the legend was true! Jody and I owe each other apologies. Our chase ended, as the aforementioned police chase did, in a garage that had seen far better days. The doors on the ramshackle garage opened for the first time ever, to anyone outside of a small, family circle. 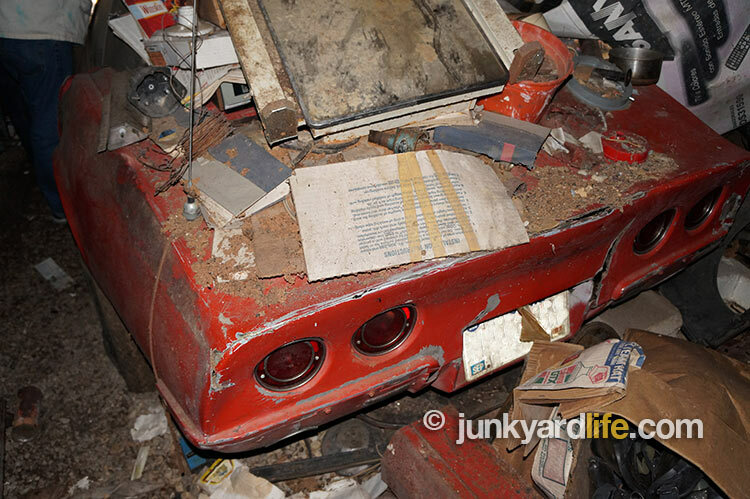 A 1968 Corvette awaited. This story began in 1974, when our hero, Mike, needed a car. He was a high school teen with Corvette fever, working at a part-time job at the S&H Green Stamp store (see the Fun Facts below). Lucky for Mike, a dealership that specialized in Corvette sales, service and restoration, was temptingly located close to his job. 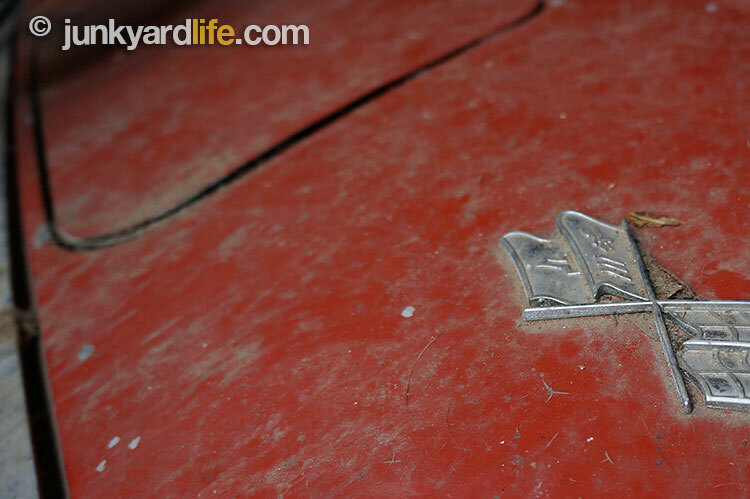 Stern negotiations and $2,900 later, the dealership pronounced him into a lifetime marriage to this 1968 Corvette. Big block glory! 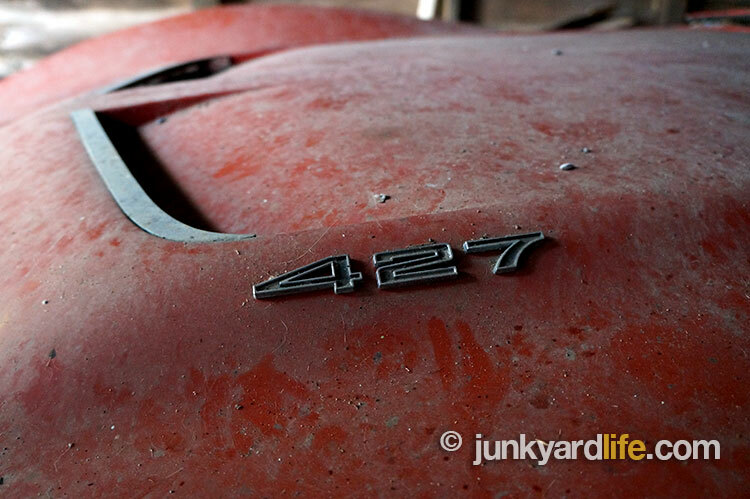 Emblems notify all lookers that 427-cubic-inches of muscle reside beneath the hood. Can you imagine growing up in a small town as the Corvette guy? Spending your senior year of high school driving a big block Vette is inconceivable for most of us. Kings are made off lesser criteria than that! Could you be trusted at that age to not smash a loud pedal? We couldn’t be. 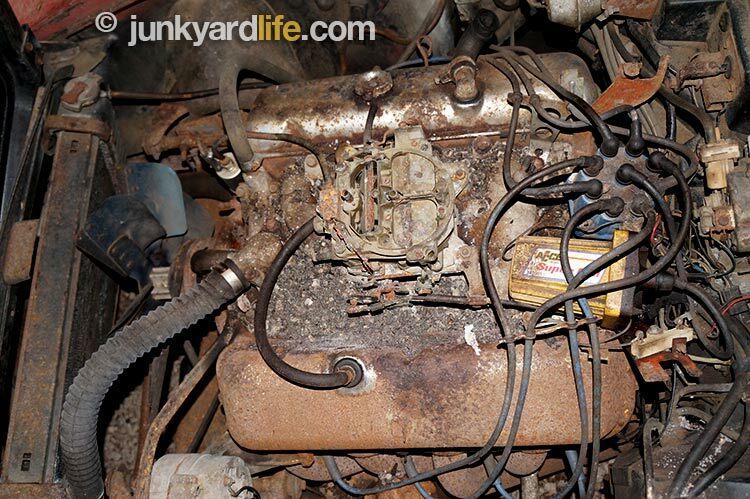 The big block 427 (not the L88 kind) has seen better days. 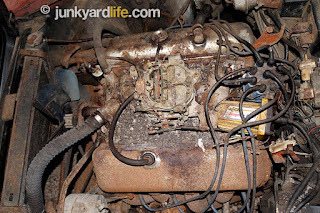 Critters have deposited something besides high-test gasoline on and around the carburetor. Options? We don’t need options! The only options we could spot on the barn-banished Vette were the 427 ground-pounder and the removable hardtop. This muscle machine was made to run without a lot to worry about. 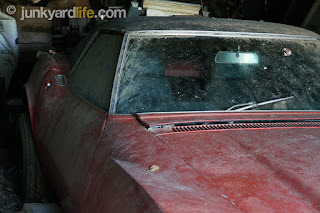 Manual windows almost go without saying, when you consider the lack of power steering and power brakes. Air conditioning would take up precious space and rob a little horsepower, so leave that off too. 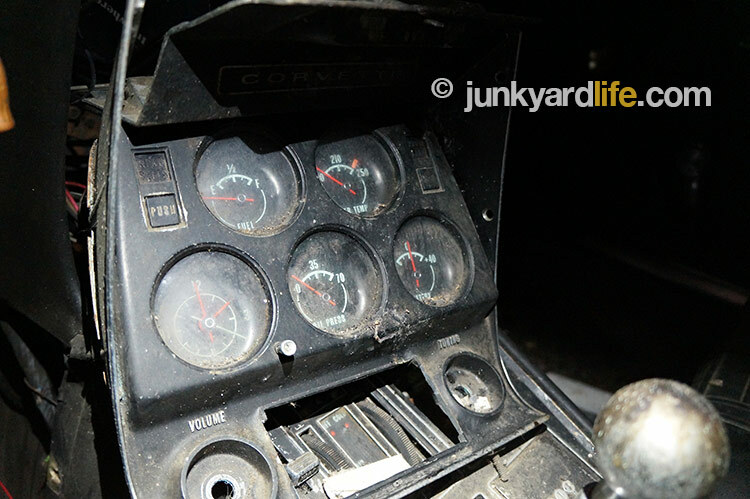 How about the famous Corvette tilt and telescoping steering wheel? That was a pretty cool option that was offered in only a couple of GM cars in 1968. Not this time. If the turn signal stalk wasn’t required, it may not have been optioned on this Vette either. 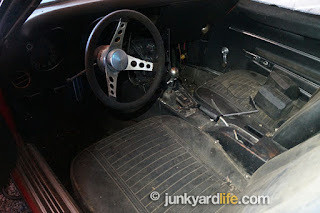 Mike made a few changes inside the 4-speed 1968 Vette during his teen years – he ditched the stock steering wheel and installed some first-gen Camaro seats. Remember custom was all the rage in the 1970s. Big Block Mike used the car for transportation and fun. One night at the local cruise haunt, Mike was challenged by four guys in four cars. Usually, one hot rod would call him out then hand over his hat, but this time four were ready to run. They drove to a secluded area and Mike lined them up, one after the other, and took their ice cream money. A brief monetary gain for the fun of racing. 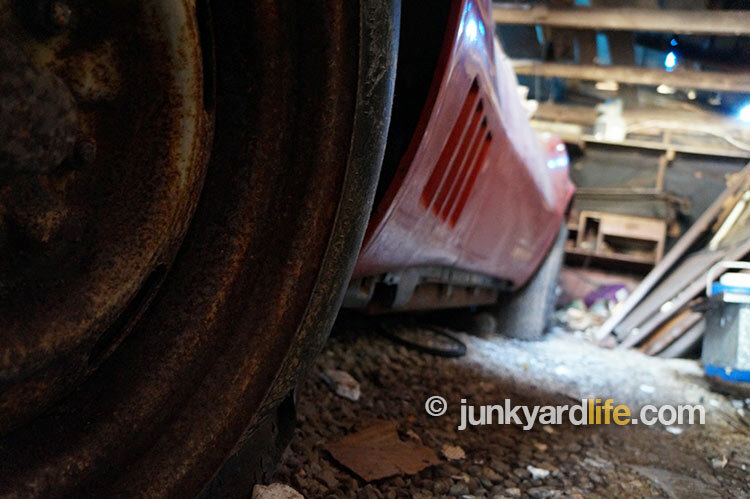 That “fun” cost him clutches and rear tires at rates greater than if he had bought any other car. The only problem with everyone knowing you drive the fastest car in town — is that everyone knows you drive the fastest car in town. People talk and during the 1970s, the Citizen’s Band Radio craze was everywhere. CB’s were the latest, really cool thing. Then, the police got them. 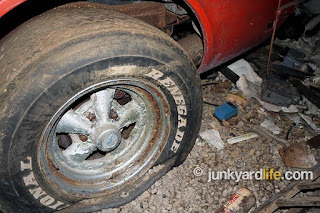 That is not good for a young hot rodder with a big block Vette. 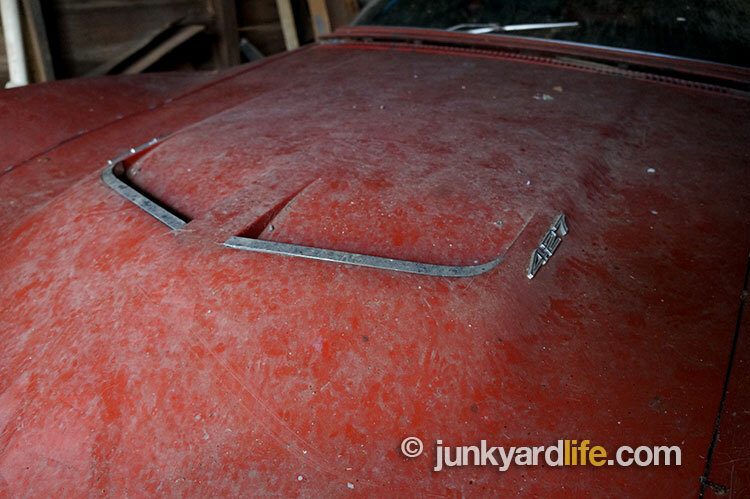 The fiberglass-bodied ’68 Vette has been beaten and abused. 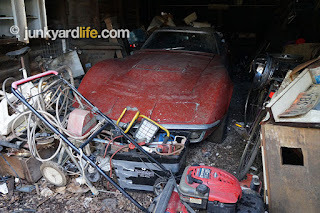 Housed in a structure with a deteriorating roof, and piled with decades of "stuff", the Vette suffered damage to the left quarter panel when a wheel came off. After outrunning local law enforcement embarrassingly bad, south bound, Big Block Mike turned around and met them again, this time, north bound. This stunt angered the cops even more, as Mike’s friend listening on a newly acquired police scanner overheard. Could we say it was another guy in a red Corvette convertible? No, that small town thing came back to haunt Mike very quickly. So, that left one option… Grow a beard, join Green Peace and have them ship Mike, and the Corvette to Alaska for whale watching duty. * Then again, there may be another option. Hide the car. So he did. And it is still there. Yes, we did. Thank you, Big Block Mike, for letting us even near the car. It really is not every day we uncover a mystery 427 Corvette in the dark recesses of a single car garage. That’s what dreams are for! 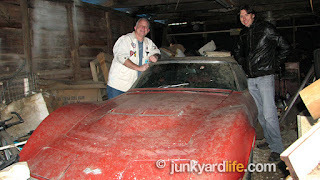 Big Block Mike, left, walks in the shadows around the 1968 Corvette he purchased in 1974 when he was 17-years-old. 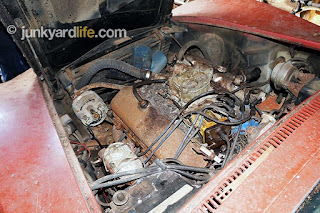 1968-1969 Corvettes equipped with 427 engines had a predisposed condition of overheating, due to a design flaw that didn’t allow the beast within to cool properly. 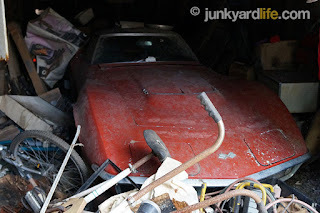 Despite higher production numbers for the 427 C.I.D and four different horsepower configurations, enthusiast grew to prefer the 327 and the 350 small block in the 1968-1969 Corvettes. If they were going to drive them at all, the 327 cars did not feel as “nose heavy” as the 427 cars. 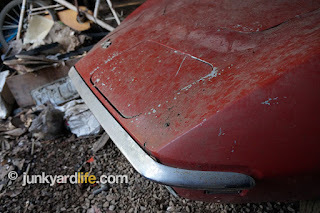 Also, the 327 cars had street manners more refined than the rumbly Rat motor. 1968 was the year Chevrolet used the Corvette center piece from the famous Rally Wheel on other cars to promote the new power disc brakes. 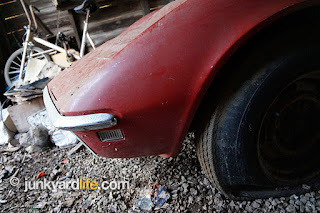 Although four-wheel disc were already in place for the Corvette, other cars now had them as optional equipment on the front end. Power door locks were not available on Corvettes until 1978. Despite lightweight fiberglass bodies, Corvettes actually are quite hefty. Our feature car, according to books, weighs almost 3,500 lbs. 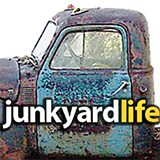 * Editor’s note: A line that we can almost guarantee has not been used before on Junkyard Life and hopefully will not be used again -“Grow a beard, join Green Peace and have them ship him and the Corvette to Alaska for whale watching duty.” — Also never ask Junkyard Life’s Ron Kidd for legal advice. This is what you could get. Barn find truth - it can get ugly under the hood. More than 19,126 of the 28,566 (67%) 1968 Corvettes were equipped with one-of-seven available 427 engine options. 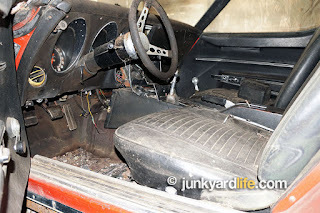 A look into the seats of a 1968 Corvette time machine. 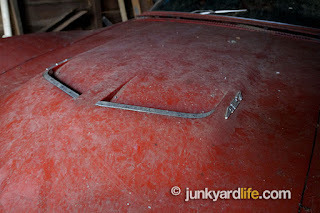 Left sitting untouched for decades in a wooden barn/shed structure. Side pipes have been removed. 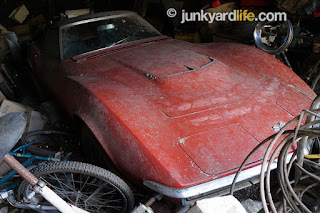 18,630 Corvette convertibles were built for 1968. Of those, 8,735 (46%) had the optional auxiliary hardtop. 3,050 (16%) of those were covered in the optional vinyl covering. 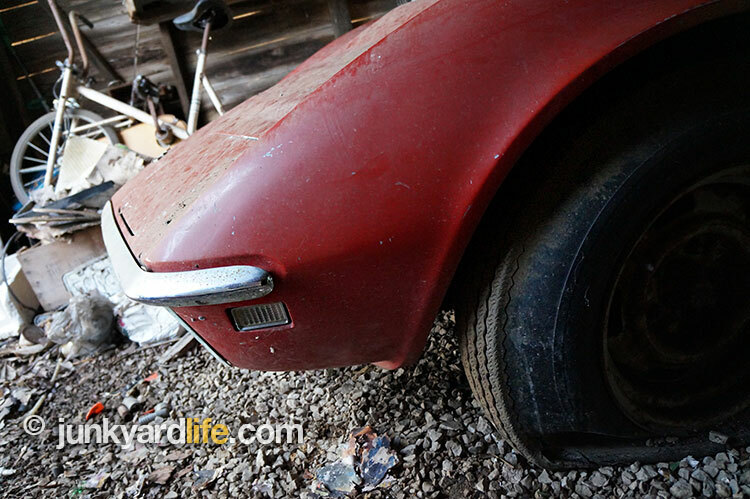 Paint code 983 tells us this ’68 Vette was originally painted British Green. British Green (4,779 or 16.7%) was the most popular color on Vettes in 1968. Lemans Blue (4,722 or 16.5%) was a close second. 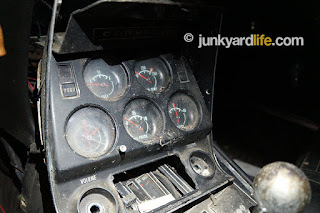 The gauge cluster and radio surround was pulled out of the dash and left on top of the 4-speed console in the ’68 Vette. 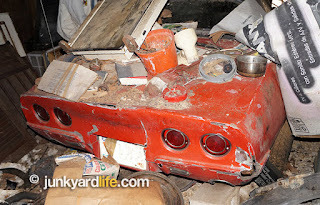 Every inch of the storage space surrounding the big block Corvette was filled with decades old clutter. 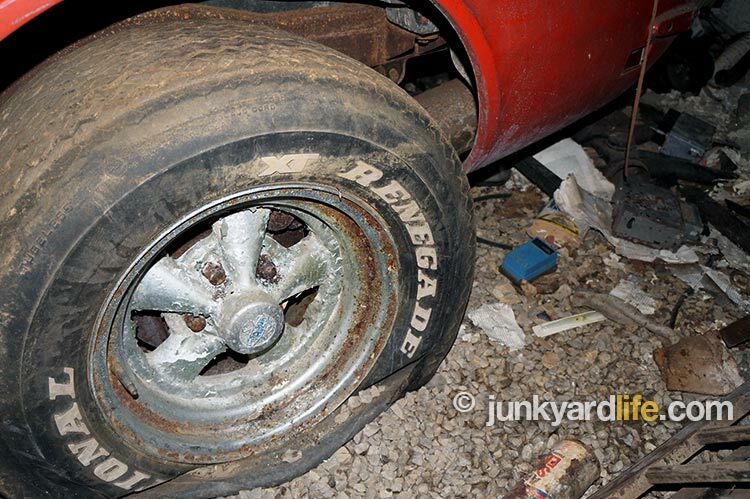 The hot rod Vette, with steep gears, still wears the big rear tires and Cragar S/S Super Sport chrome wheels from its glory days of street racing. The Vettes famed crossed flags adorn the nose of the ’68. 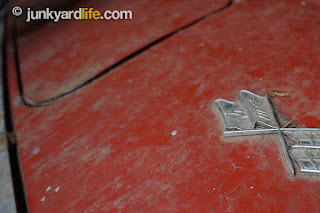 Missing in 1968 was the "Sting Ray" badge. In 1969, Chevrolet would add the "Stingray " name back on the Corvette, but as "Stingray" - one word. Big block 427 Corvettes received this special hood in 1968. The L-88 versions, only 80 built in 1968, needed an even taller hood to clear that engine’s high-rise aluminum intake. 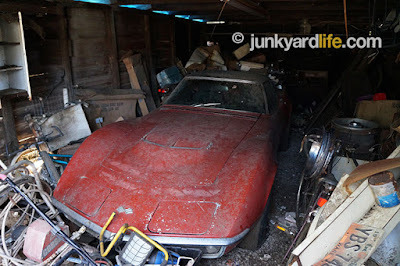 We hope better days are ahead for Mike’s ’68 Vette. A dealership repaired the quarter panel after a loose wheel mishap ripped away a chunk of the body. The sloped-nose on the redesigned 1968 Vette provided a huge aerodynamic advantage over the C2 models. Proper storage situations make a big difference when protecting your classic car investment and your memories. 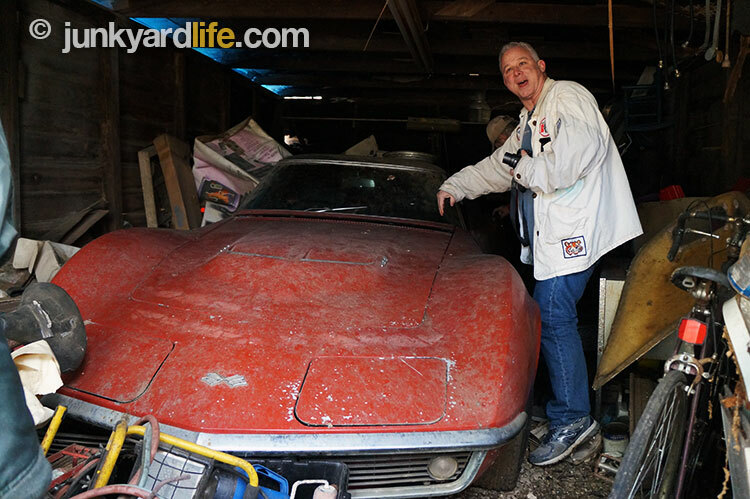 The mystery Corvette remains in hiding until its owner can fund a restoration and relive the glory days once more. Ron Kidd, left, and Jody Potter, right, brave the frigid 20-degree temps to explore the Corvette barn find legend.